After many years of artistic practice and numerous art schools I realised I was much more interested in inspiring and caring for creativity than I was in the end product. The process was where it all happened for me, and I felt very fortunate to stumble upon Art Therapy where I could receive specific training in utilising with others the way I had always used art for healing in my own practice. Unlike the art schools I went to, the studies in art therapy also taught me how to cultivate and care for my relationship with creativity, which I feel is a special resource to share with people. It confirmed for me some things I always suspected – everyone is creative, but they just either doubt it or have not found a comfortable expression for it, and the other thing was that art can heal and express things in a way that talking can’t. This knowledge soothed me to the core of my being, and lit my soul up like mountain top beacon, and I felt there was nothing more important for me to share with the world…. I still feel like that. I love to work with people who say – “I’m not creative”, “I can’t draw for nuts”, or “my 3 year old can draw better than me”. Right there is often the beginning of an incredible journey into undiscovered resources, and the awakening of a bud of new possibility. I have a great love of learning and have studied in official universities, T.A.F.E’s, learning institutes, monasteries and peoples living rooms. 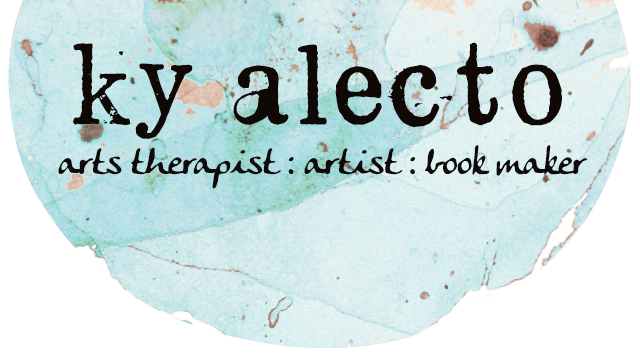 I have an Advanced Diploma of Transpersonal Art Therapy, Certificate of Narrative Therapy, Bachelor of Visual Arts, Diploma of Advanced Specialised Kinesiology and various other certificates. These titles express my dedication to learning and to offering a service to people that is safe, effective, gentle, interesting, and CREATIVE. Creativity really is a human resource that everyone can learn to use for therapeutic purposes and life enrichment. If you would like to book a session or find out more, I would love to speak with you. © 2014 Ky Alecto, Inc. All rights reserved.